The Hive metastore stores metadata about objects within Hive. 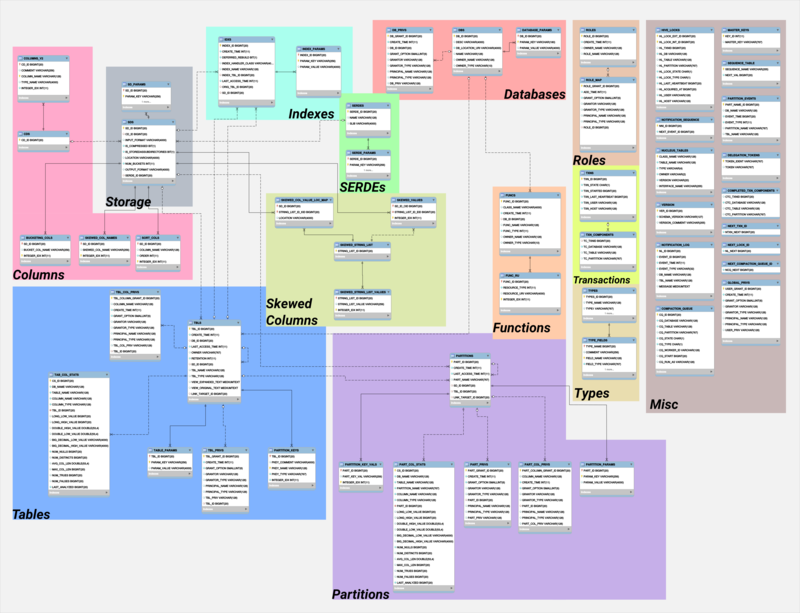 Usually this metastore sits within a relational database such as MySQL. Sometimes it’s useful to query the Hive metastore directly to find out what databases, tables and views exist in Hive and how they’re defined. For example, say we want to expose a report to users about how many Hive tables are currently in a Hadoop cluster. Or perhaps we want to run a script which performs some bulk operation on all tables in a particular Hive database. Luckily, it’s easy to query the metastore using a tool such as MySQL Workbench using appropriate connectors – e.g. MySQL JDBC drivers. It’s possible to query metadata from the Hive metastore which can be handy for understanding what data is available in a Hive instance. It’s also possible to edit this information too, although this would usually be inadvisable as the schema of the metastore may be subject to change between different Hive versions, and the results of modifying Hive internals could be unexpected at best, and catastrophic at worst.